The lowest-hanging fruits of chimeric antigen receptor (CAR) T-cell therapy are already being plucked. Yet even these fruits, which include Kite Pharma’s Yescarta and Novartis’ Kymriah, cannot be described as easy pickings. They obliged their developers to stretch their own capabilities while staying in touch with the latest research findings. Nonetheless, Yescarta and Kymriah, both of which are FDA-approved immunotherapies, are limited to treating hematological tumors, or “liquid” tumors—as are many of the CAR T-cell therapies currently in development. Such therapies spare developers the arduous climbing that awaits those who would position CAR T-cell therapies to engage solid tumors. CAR T cells have difficulty grappling with solid tumors several reasons: CAR T cells may search in vain for a unique tumor-associated antigen; they may expire, fail to proliferate, or simply languish, dawdling rather than converging on tumor sites; they may struggle to cope with tumor cell heterogeneity and antigen loss; or they may succumb to the immunosuppressive and metabolically hostile tumor microenvironment. How might CAR T cells overcome these difficulties? That question was asked repeatedly, in different contexts, by members of the cell therapy community who participated in the CAR-T Congress: Maximizing the Potential of CAR-T Therapy. At this event, provisional answers included novel infusion strategies, improved targeting and control of CAR T cells, the adoption of alternative receptor technologies, and the generation of alternative CAR-carrying cells. The most interesting suggestions from this event are summarized in this article. As varied as these suggestions are, they all aim to combine two powers: the power of an antibody to recognize its specific antigen, and the power of a T cell to deliver a vigorous immune response. In his CAR-T Congress presentation, Dr. Kassim drew on lessons from Mustang Bio’s collaboration with the City of Hope Beckman Research Institute and Medical Center. Specifically, he referenced a recent study led by the City of Hope’s Stephen J. Forman, M.D., and Behnam Badie, M.D. The study, which appeared in the New England Journal of Medicine, suggested that while a leukemia or lymphoma may be impacted by a single systemic infusion of tumor-specific CAR T cells, solid tumors may require multiple, regional infusions. To flesh out this notion, City of Hope investigators described a novel administration approach against multifocal glioblastoma, one of the most lethal cancers. Multifocal glioblastoma has a five-year survival of about 5%—due in part to the brain’s sequestration behind the blood-brain barrier. After tumor resection, CAR T cells specific for the interleukin-13 receptor α chain variant 2 (IL13Rα2) were infused weekly directly into the cavity created by removal of the primary tumor. Subsequently, the therapy was administered weekly into the cerebral ventricles, which allowed systemic distribution within the nervous system. Finding (and hitting) the right target can be difficult. 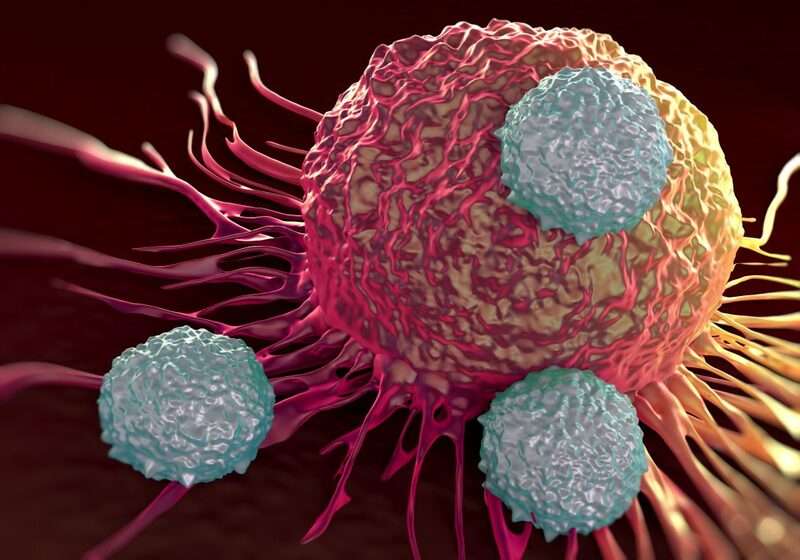 “The antigens that are present in solid tumors are usually expressed in other tissues of the body, or there is great heterogeneity,” said Peggy Sotiropoulou, Ph.D., R&D manager, Celyad. “Consequently, the antigens are not expressed in all the tumor cells.” She added that tumors that do express the antigens may reside in an immunosuppressive microenvironment, that is, an environment that can suppress the activity of CAR T cells. To tackle these issues, Celyad engineered T cells expressing a CAR composed of the full-length human natural killer group 2D (NKG2D) receptor fused to the CD3ζ cytoplasmic signaling domain. As its name suggests, the NKG2D receptor is derived from natural killer cells. The CD3ζ chain, which is found in most antibody-based CARs, provides the primary stimulatory signal within the T cell when the NKG2D receptor binds to a ligand. The NKG2D receptor targets eight different ligands that are normally expressed in cells after infection and other types of stress. Most important, as Dr. Sotiropoulou noted, these ligands are expressed by most types of cancer cells, but they are not expressed at all (or above very low levels) by healthy cells. The NKG2D-based CAR serves as the basis of Celyad’s lead CAR T-cell oncology candidate, CYAD-01. (Celyad’s NKG2D-CD3ζ CAR T cell was previously referred to as CAR T NKR-2.) NKG2D attracts a costimulatory adapter protein, DAP10, which is normally expressed in natural killer cells and T cells. Besides recognizing the formation of DAP10-stabilized NKG2D constructs, Celyad evaluated whether CYAD-01 would perform better if it incorporated an additional cytoplasmic costimulatory domain. When Celyad tried adding CD28 or 4-1BB costimulatory domains, which are known to confer interesting properties to classical scFV-based CAR T cells, the company found that neither CD28 nor 4-1BB provided any advantages to NKG2D-based CAR T cells in vitro. Although the CAR T cells themselves don’t seem to persist, a long-term antitumor activity was observed in mouse models. “These CAR T cells modulate the microenvironment and boost the immune system of the host so that you can have an immunological memory,” Dr. Sotiropoulou asserted. Having demonstrated some efficacy and a good safety profile in low-dose clinical trials for hematological cancers, CYAD-01 is currently in a dose escalation trial for several different solid and liquid tumors. He sees the field pivoting away from CARs and toward the use of engineered TCRs to combat solid tumors. Yet TCRs are human leukocyte antigen (HLA)-restricted, meaning that they will recognize antigen only in the context of a given HLA—and different people carry different HLAs. “This is a major drawback when it comes to recruitment of patients,” Dr. Hofmeister insisted. TCR2 has developed a hybrid platform called TRuC that utilizes the entire TCR complex to drive T-cell activation, yet is independent of the HLA. “We tether an antibody-binding domain to one of the TCR subunits (in the lead program, we tether it to the ε chain) … which gets integrated into the natural TCR complex,” he explained. TCR2 Therapeutics has developed TRuC, which stands for T cell Receptor fUsion Construct. According to the company, TRuC is the first engineered T-cell platform to use the complete T-cell receptor (TCR) complex without the need for human leukocyte antigen (HLA) matching. By conjugating tumor antigen binder (for example, scFV, sdAb, Fab) to the TCR complex, the TRuC construct can recognize highly expressed surface antigens on tumor cells without HLA and employ the complete TCR machinery to drive the totality of T-cell functions required for tumor killing. Cytokine release syndrome and lack of durability in CAR T-cell therapy may due, at least in part, to too many of the wrong cells being active. “Groups using lentivirus to produce CAR T cells are seeing anywhere from 5 to 30% of the T-cell product that they infuse actually express the CAR,” said Devon Shedlock, Ph.D., vice president of preclinical development, Poseida Therapeutics. Although retroviruses enter effector memory T cells and also, to some extent, central memory T cells, they are effectively excluded from the early naïve T and stem cell memory T (Tscm) cells. Thus, many nonmodified T cells are being introduced that also become activated and can potentially contribute to making cytokines and inflammatory mediators. Poseida instead uses a transposon-based system, the PiggyBac DNA Modification System, to produce their CAR T-cell products. PiggyBac has a large cargo capacity—enough even for several CARs and other genes to be introduced as a single transgene—allowing it to accommodate additional elements such as caspase-based safety switches as well as a drug-resistance genes for positive selection. PiggyBac seems to prefer early naïve T and Tscm cells. After selection is carried out, virtually 100% of the T cells express the CAR, and more than 70% are Tscm cells. “Undoubtedly, the explosiveness of CAR potential holds promise for diverse scientific disciplines, as different specialties bring expertise that can further advance this immunotherapy. For example, while T cells are an obvious choice for CAR engineering, other cell lineages have attributes that might be advantageous for the treatment of distinct patient populations. “Harrer et al. review efforts to extend the CAR paradigm by engineering subsets such as natural killer, natural killer T, myeloid, and hematopoietic stem cells. The special May issue containing ten full access articles, including the editorial and the below interview, can be found at: www.liebertpub.com/toc/hum/29/5. An Interview with Michel Sadelain, M.D, Ph.D.
Jennifer E. Adair spoke with Dr. Michel Sadelain, director of the Center for Cell Engineering at Memorial Sloan-Kettering Cancer Center, and one of the leaders in the field of chimeric antigen receptor (CAR)-engineered T cells. Jennifer E. Adair: With the first Food and Drug Administration (FDA) approval of CAR T-cell therapy for the treatment of hematologic malignancy last summer, the field has come a long way since the first pivotal reports in the late 1970s and early 1980s demonstrating that the immune system matters in cancer. Can you tell us about when and where your interest in CAR T-cell therapies originated? Dr. Michael Sadelain: 2017 is indeed a banner year for cell and gene therapies with the first approvals of CAR therapies, and likely many more to follow. This is the fruit of decades of preclinical research on T-cell engineering. For me, this endeavor started about 30 years ago, when I was a PhD student in immunology after having previously obtained a medical degree. It was at the time becoming clear that the immune system could, on occasion, eliminate tumors. Oncologists had already observed rare, seemingly spontaneous tumor regressions occurring in association with autoimmunity; bone-marrow transplanters were coming to realize that much of the benefit of their transplants was due not to chemotherapy but to T cell–mediated graft-versus-tumor responses. The latter was an accidental discovery of the potency of adoptive cell therapy insofar that the motivation for the transplant had been the need for hematopoietic rescue following intensive chemotherapy. The increased relapses that occurred when T cells were removed from the graft (to prevent graft-versus-host disease) made it clear that it was the T cells that eliminated residual tumor and prevented relapse. To me—I was a graduate student around that time—this realization meant that one could not rely on the unpredictable T-cell specificities of a graft to consistently achieve tumor rejection without inflicting collateral, occasionally lethal, T-cell damage. I concluded that engineering T cells to be tumor specific and safe could resolve this conundrum and that genetic approaches would be the best way to achieve this goal. The nascent field of cell engineering was at the time focused on monogenic blood disorders that could potentially be cured by introducing wild-type genes in hematopoietic stem cells or other cell types. Some thought that one could treat tumors with tumor suppressor genes or suicide genes. But engineering T cells just seemed to be the wrong trail to blaze. And so while my official project was about something else (globin gene transfer for hemoglobinopathies), I of course started working on T-cell engineering. The first abstract that I published—which I think is the first report in the literature on the genetic engineering of primary T cells—was presented at the World Congress of Immunology in Budapest in 1992. For me, that marks the beginning of T-cell engineering—and that was exactly 25 years before the first approval of CAR therapies. JA: I think that is a great testament to the progress of the field. MS: Absolutely. It took years to introduce just one gene into T cells (which, by the way, was the Escherichia coli LacZ gene; this was before green fluorescent protein). It had taken me three years to succeed in reproducibly transducing a small fraction of murine primary T cells. Today, you can teach a high-school student in an afternoon how to introduce genes in 100% of freshly collected T cells, and we have a number of different techniques that are very efficient and nontoxic, spanning RNA vectors, DNA transposons, and a range of gene-editing tools. That is, as you say, testimony to the enormous progress in the field of gene transfer and cell engineering. This also makes the point why T-cell engineering, building on the success of CD19 CAR therapy, is positioned to remain at the forefront of the clinical translation of a number of genetic engineering modalities. For example, the introduction of gene editing and CRISPR-based approaches in the clinic will likely begin with T-cell therapies because of the relative ease of T-cell manipulation and transduction, combined with the relevance of T-cell therapies to a large number of disorders, including cancer and others. JA: Following that train of thought, what do you think the defining feature of the next-generation CAR will be? MS: Today's paradigm is CD19 CAR therapy. That is the setting where there is the largest collective experience and the deepest knowledge. We identified CD19 as an attractive CAR target in the late 1990s, which we reported in 2003 in Nature Medicine, based on a series of criteria (high and relatively homogenous expression in virtually all cancer cells and absence from vital tissues among others).1 Future applications will build on this foundation. Different challenges will have to be addressed to apply the CAR concept to other cancers. JA: What do you think are the largest challenges? MS: There are a few. One is to decrease the toxicities that occur in a subset of patients undergoing CAR therapy. As you see from the recent FDA approvals, there are substantial restrictions on how and where this new medicine can be administered because of early toxicities such as cytokine release syndrome (CRS). The good news is that we have ways to manage CRS, but the broad use of present CAR therapy is limited by the need for specialized management. So, we have to understand the physiopathology of the CRS in order to design better CAR T cells that are less prone to causing this syndrome and come up with better means not just to treat CRS but to prevent it. I am optimistic that will happen quite soon. Another big challenge is to tackle other cancers, in particular solid tumors. There are two orders of challenges. One is finding suitable targets for these other cancers, and the other is adapting the CAR design to overcome the particular microenvironments associated with different tumors. The CARs that are currently approved have been optimized for use in hematological malignancies. They are effective against B-cell malignancies and will hopefully perform as well against myeloma and acute myeloid leukemias. I believe that for solid tumors, something different and better adapted to the microenvironmental challenges will be necessary. I think a third big challenge is to figure out ways to generate T cells at a lower cost. That too is a barrier to the broader use of this powerful technology, and to do that will require combining inventions of a biological or technological nature. Can we identify the best T-cell subsets to engineer? Can we enhance the functional and metabolic properties of T cells through improved CAR designs? We need to generate (through selection and engineering) T cells that persist for as long as is needed without succumbing to T-cell exhaustion. Those are biological issues that bear on CAR engineering. Then there are the device and technological issues. Can you robotize, miniaturize, and rapidly identify the best T cells for adoptive therapy? There are many new ideas today to advance T-cell manufacturing that are being developed at different academic centers or companies. So, those are three issues: diminishing the toxicities; extending the approach to solid tumors and other cancers; and figuring out ways to make cells that are more efficacious, cheaper to make, and more easy to distribute. The so-called off-the-shelf approaches are a tantalizing albeit challenging vision to meet all of these goals. JA: Along those lines, what other disciplines would you specifically recommend be solicited to fill in those gaps? CAR therapy feeds off a lot of tumor immunology, but it certainly is not conventional or orthodox immunology, as it is based on synthetic receptors and pharmacological circuit rewiring. A CAR is a synthetic molecule. Its individual components are natural, but they are assembled into a novel structure that only partially mimics natural functions and acquires new features. It is really a creation of humankind that is distinct from anything natural. It is fair to say that conventional immunologists did not accept the CAR concepts for a long time because of their synthetic nature. CAR therapy requires the identification of different types of targets compared to those the immune system normally recognizes through the physiological receptor for antigen, which is called the T-cell receptor or TCR. The TCR normally recognizes peptide–human leukocyte antigen complexes, unlike CARs, which recognize molecules on the cell surface. These do not have to be peptides or proteins. They can also be carbohydrates or glycolipids. So, what CAR T cells recognize and how they recognize it opens up a new way of looking for immune targets. The field also draws on a number of technologies for cell manipulation. That too is a field that will likely develop a lot in the years to come. I am quite fascinated to see all the people who are now thinking of creating new devices, from closed bioreactors to microchips to isolate, separate, differentiate, and/or reprogram T cells better. There is a need for new devices and tools to expand cell therapies on a larger scale. I think that biophysics, microfluidics, and engineering will all contribute to advance the field. The CAR paradigm is not only drawing on other fields but also giving back to some of them. Synthetic biology is a science that has long focused on creating genetic circuits in bacteria and simple systems. I am very excited when I go to places such as the MIT and see a new generation of young synthetic biologists who see T-cell engineering as a possible real-world outlet for their research. Synthetic biologists have explored and perfected the genetic rewiring of different cellular organisms, but rarely with a view to develop applicable medical solutions. CAR therapy provides an inspiration and a model for these researchers. Another field that may be spurred by CAR research is that of cell surface proteomics, which I hope will help identify new and better targets in different cancers. I really think that the success of CD19 CAR therapy is inspiring other fields of science and medicine, and it is wonderful to see that happen. JA: In closing, what is your prediction for the CAR T-cell therapy field in 10 years? MS: I believe that we will further advance the design of far-better T cells that are safer in their use and smarter in the way that they can discern tumor cells versus normal cells. I believe that by then we will have made considerable progress in other hematological malignancies, such as myeloma and acute myeloid leukemia. And I do think that there will be several successes in solid tumors. There is no reason why engineered T cells could not have profound effects on solid tumors. We already know that T cells can be effective against melanoma, that tumor-infiltrating lymphocytes can be effective in various carcinomas, and that responses to checkpoint blockade are mediated by endogenous T cells. So, T cells definitely can do a great job against solid tumors. We need to find out what are the right targets and the right engineering strategies. This may not be easy, but it must be feasible. I also believe that T-cell manufacturing will undergo a complete transformation. We are particularly interested right now in harnessing pluripotent stem cells to derive the entire T cell in vitro, rather than to having to start from blood collections in a personalized fashion. I am convinced that T-cell production will make enormous progress in the next 10 years. Finally, I do hope that CARs will be explored beyond oncology. In principle, there is every reason to believe that engineered T cells could have a great impact in autoimmune diseases, organ transplantation, and the treatment of refractory infectious diseases. I hope that over the next decade, we will start seeing some examples of that.